The morphology and structural stability of metal/2D semiconductor interfaces strongly affect the performance of 2D electronic devices and synergistic catalysis. However, the structural evolution at the interfaces has not been well explored particularly at atomic resolution. In this work, we study the structural evolution of Au nanoparticles (NPs) on few-layer MoS2 by high resolution transmission electron microscope (HRTEM) and quantitative high-angle annular dark field scanning TEM. It is found that in the transition of Au from nanoparticles to dendrites, a dynamically epitaxial alignment between Au and MoS2 lattices is formed, and Moiré patterns can be directly observed in HRTEM images due to the mismatch between Au and MoS2 lattices. This epitaxial alignment can occur in ambient conditions, and can also be accelerated by the irradiation of high-energy electron beam. 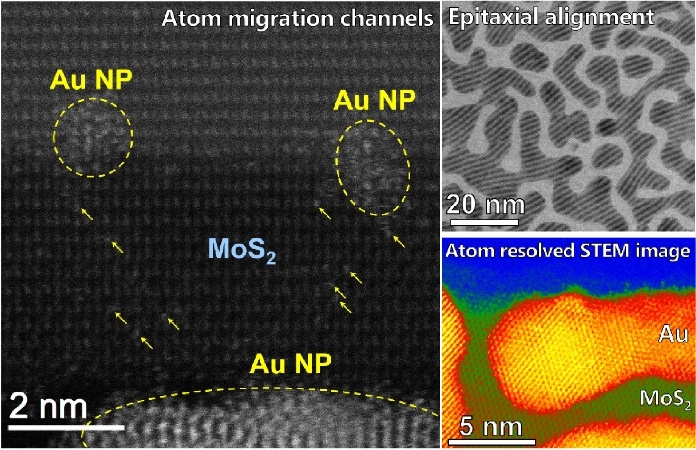 In situ observation clearly reveals the rotation of Au NPs, the atom migration inside Au NPs, and the transfer of Au atoms between neighboring Au NPs, finally leading to the formation of epitaxially aligned Au dendrites on MoS2. The structural evolution of metal/2D semiconductor interfaces at atomic scale can provide valuable information for the design and fabrication of the metal/2D semiconductor nano-devices with desired physical and chemical performances. Supplementary material (schematic diagram of the fabrication process, energy dispersive X-ray spectroscopy of Au deposited MoS2, the overall morphologies of Au on MoS2 at the same location with time elapse, Au particle size distributions, the TEM image and diffraction pattern of Au NPs on amorphous carbon, line profiles of the contrast between the nearest points of the gap in HRTEM images, the atomic-resolution HAADF STEM image showing matter transfer channels of Au atoms on MoS2, the formation process of the matter transfer channels of Au atoms on MoS2, HRTEM image showing the comparison of morphologies of Au on MoS2 and amorphous carbon film) is available in the online version of this article at https://doi.org/10.1007/s12274-019-2329-4. 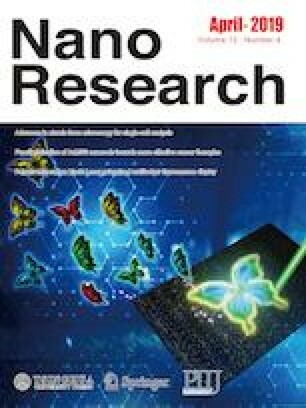 The authors thank Fangtao Li, Hongsheng Fan, and Sibin Duan for helpful discussions. This work was supported by the National Natural Science Foundation of China (Nos. 11604010 and 11674023), 111 Project (No. B170003), and the Fundamental Research Funds for the Central Universities (No. FRF-BD-18-004A).